HIWC Bazaar tickets on sale now at UNIS Hanoi! 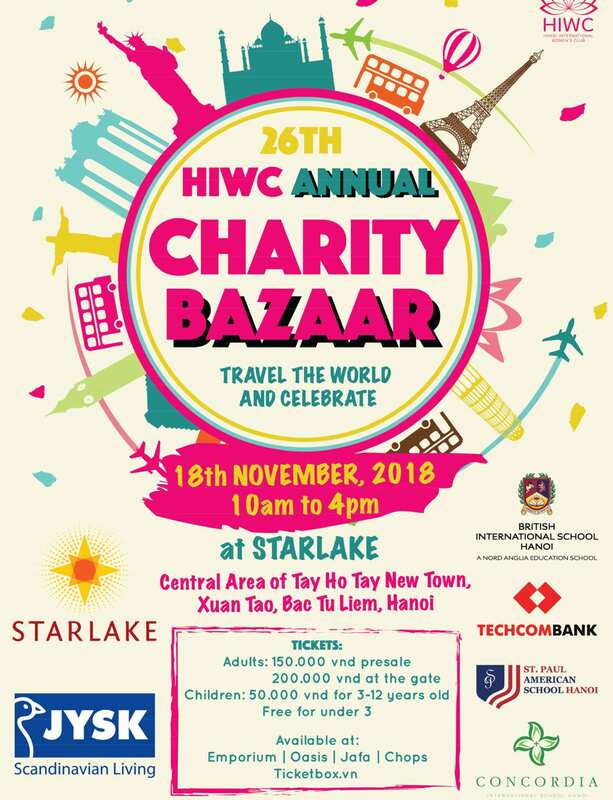 UNIS Hanoi is proud to once again sponsor the Hanoi International Women’s Club (HIWC) Annual Charity Bazaar which will take place on Sunday, 18 November at Starlake (nearby UNIS Hanoi in Tay Ho). The HIWC Bazaar is one of the largest family events in Hanoi with international food, shopping, and fun for all ages, raising an incredible amount of money for good causes. If you have time to spare, you can still sign up HERE to volunteer. This year’s theme is “Travel the World and Celebrate,” something our diverse, multicultural community from around the globe can certainly contribute to! Tickets can be purchased online HERE, or in person at UNIS Hanoi reception desk in the Admin building from 8.00 – 12.30 and 13.30 to 17.00 on weekdays.